the heat, and at the time swarms of ladybirds in our vicinity. bunch of lads who showed me all the usual haunts of sea going personnel in the center of Bristol. I stayed in digs run by a Liverpudlian landlady, which was very homely, even down to many ladies of the night staying with the other students. It was during my time there that I was informed that due to not having completed a years sea time I would not be able to obtain the final qualification, which should have been pointed out to me prior to starting the course. However, it kept my hand in with the equipment I would be servicing and repairing when I eventually resumed my sea going career with the Bibby Line. The course and the lecturers were first rate, and it gave me a solid background to working on engine room electronic systems such as the bridge Control Units, and especially boiler control electronics.The Radio Room and Bridge electronics available at Brunel were very up to date, we even had access to one of the first ARPA radars available, and exposure to the first computer electronics teaching aids. (ARPA – Automatic Radar Plotting Aid). The actual complex was also utilised by young ladies who wished to commence their work career as hairdressers. They were always looking for recruits to be guinea pigs so a relatively cheap haircut was always available during term time. Although after the final examinations I was not awarded the diploma due to lack of sea time. I really enjoyed my six months at Brunel college. Six years later I was to attend Riversdale College in Liverpool to undergo the same course at Bibby Line’s expense and this time gained the qualification. Two happy years early 60s in Rad78. Norman Rush got me thro’ PMG2 n Lofty Allen morse. 2nd year had Lofty helping out on the 1st course as well, which was a hoot with frequent 4 letter words when asked a tricky question, plus of course his morse class. Got me a 1st plus the BOT Radar licence. Lofty’s love of radio had several of us operating G3FDT and some of us got our amateur radio callsign, in my case G3RKF. Still use a manual key, with little love of ssb. Went to sea with PnO n last ship was ssIberia/GBCN. Came ashore to gain knowledge and ended up mostly in the semiconductor industry. Figured out early that I was never ever going to be a professional design engineer, so career was more commercial. Bull S..t baffles brains, even at Harvard Business School! Bristol set me off on a on an exciting fun career, thanks to Fred Barltrop’s team of fine lecturers. I was at Brunel and left in 1974 I was in Rad 144 if my memory serves me correctly. I remember all of the lecturers mentioned above, especially Norman Rush who not only threw the board rubber but also had his classroom clock set 5 mins fast and called it NMT-“Normans Mean Time”. This was persumably to let him finish early. The students union bar was across the road and on many occasions towards the end of each week had live bands (some quite well known). In my opinion it was an excellent college (for RO training), hard work but good fun. I was at Brunel from 72 to 75 having become rather fed-up as a Bristol PC and being on a shift with two ex matelots they persuaded me to “go to sea”. At the time there was a shortage of ROs and I wrote to both BP and Shell Tankers suggesting that if they paid me whilst I studied for 3 years then I’d be happy to work for them when I finished. Both companies agreed and decided to set-up a Radio Officer Cadet scheme at Brunel. The BP scheme was the more modest of the two deciding to have 7 cadets but to leave them in absolute freedom as students and just pay a modest salary. Shell opted for about 20 Cadets and paid about 30% more than BP but in return they required the wearing of navy-blazer with Shell company badge, white shirt and Shell company tie. Oh… and the College (Mr Metcalf) insisted that you could only apply to join one scheme…. naturally I applied for both — I was an ex-copper after all and didn’t take orders well. Reardon Smith also set up a scheme but their ROs took the shorter two year course covering the MRGC and DTI Radar. The Shell (3 year) course included the City & Guilds(292) MRRT & CGLI Telecommunications Technician certificates as well as the MRGC & DTI Radar. At the time the “Long Silence” was appearing on the horizon, although we were never told explicitly, and hence Shell were positioning their Cadets to become “Electronics Officers” which was the phrase quietly spoken… although it was some years before it happened. Shell also encouraged their ROs (with the CGLI Certs.) to go back to Brunel after at lest two years at sea and take the Full (Advanced) CGLI certificates which gave the T.Eng (Technician Engineer) Certification. And in (I think) 1975 Cardiff University introduced their “Degree Scheme for Radio Officers” a BSc Hons. that covered all bridge and engine room electronics as well as advanced Telecomms study. And so by 1975 the writing was on the wall and the transition to ETO was being planned. Was at Brunel Tech from 1976-1979. Excellent lecturers all round, including the legendary Lofty Allen, who took us for morse code training and commercial working. Passed the MRGC and DoT Radar but unfortunately R/O jobs at sea were few and far between. 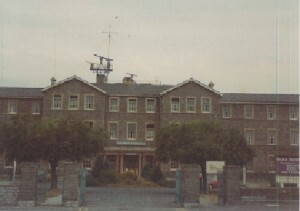 Joined the BBC as a radio technician at the Monitoring Service near Caversham before joining Portishead Radio/GKA as an R/O in 1980. Nothing but good memories from Brunel – throwing snowballs at the lecturers from the gantry where the radar scanners and aerials were located in the winter – playing cricket on the grassy area behind Muller House in the summer. The student union bar over the road where we would take on liquid refreshment before the afternoons lectures on aerial theory (and only just keeping awake). Phil Brouder and his tales of being an R/O at sea – learning new swear words from Cliff Smith whilst almost setting a Radiolocator 2 on fire – Norman Rush and his accurate board rubber throwing – amongst many others.